The Olympic torch will be in Wasaga Beach for 19 minutes on Tues., Dec. 29. Officials hope people will come out and cheer on the torchbearers as they travel through town. RBC Royal Bank is a corporate sponsor for the event. Wasaga Beach RBC branch manager Glen Godovitz said they were able to release the route as of Dec. 15. On Dec. 29, day 61 of the Olympic torch relay, the torch will start in Owen Sound and travel to Meaford, Thornbury, Blue Mountain, Collingwood, Wasaga Beach, Elmvale, Penetanguishene, Midland, Creemore, Wyebridge, Angus, CFB Borden, Alliston, Cookstown and Barrie. The torch will arrive in Wasaga Beach as part of a special convoy of vehicles including torchbearer shuttles, media, support vehicles and police. Officials say temporary rolling road closures will happen along the route to ensure the safety of torchbearers and spectators. The route begins at the Wasaga Beach Public Library, located at 120 Glenwood Dr., at 11:12 a.m. continues along Glenwood, turning right at Main Street, left onto River Road West and stops at Wasaga Stars Arena for a brief photo op before heading off to the next community at 11:31 a.m. It is still not known who exactly is carrying the torch at 300-metre intervals. Wasaga Beach resident Faye Luppe is carrying the torch from the library to town hall. Wasaga Beach resident and Collingwood RBC branch manager Penny Baker is carrying the torch in Collingwood on Dec. 29 and Wasaga Beach resident Rebecca Kilpatrick, also an employee at RBC in Collingwood, will carry the torch in Barrie on Dec. 30. RBC will have a tent set up outside of the branch, located at 654 River Rd., W., where officials will be hading out pompoms and thunder sticks to help spectators cheer on torchbearers. Godovitz said they will also be serving free pizza from Boston Pizza and will be distributing 250 Purdy's chocolates, an official event sponsor. 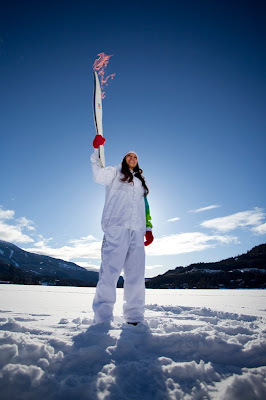 The library is inviting people to make Olympic torches from 10 a.m. until 11 a.m. and then cheer on the torchbearers. The free event is open to people of all ages. Wasaga Beach musician Tyler Firestone is performing at the torch ceremony in Collingwood. Firestone will lead the singing of Oh Canada as the torch comes along Hurontario Street at 10:04 a.m. and will be performing on the stage afterwards at 10:16 a.m. Amanda Coles, of Barrie, is the winner of the RBC DeNovo Olympic Contest. Coles entered the national contest, open to RBC branches that have opened within the last 10 months, at the Wasaga Beach branch. She has won a $15,000 trip for four to the Olympic Games, including tickets to six events. Each branch also awarded a second place prize of a set of sterling silver Olympic coins from the Royal Canadian Mint. Beverley Burton was the local winner. I am the sort of guy who enjoys to taste different stuff. Presently I am making my personal solar panels. I'm making it all by myself without the help of my staff. I'm utilizing the net as the only way to acheive that. I came across a truly awesome website which explains how to create pv panels and so on. The site explains all the steps needed for solar panel construction. I'm not exactly sure bout how precise the info given there is. If some people over here who had xp with these things can have a peak and give your feedback in the page it would be great and I would highly treasure it, cauze I extremely would love to try solar panel construction. is amazing how the torch has traveled through different places around the world I find fascinating.